HiYa, Ducky here. 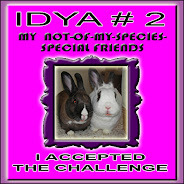 Well tonight I have to wish my sweetie Dora a safe journey. She needs to teleport back to kittie jail so her beans can pick her up tomorrow. She will be back home on Wednesday. Mum says Dora has been the purrfect house guest. Yep, my lovely ladycat made a good impression on mum. As for me, guess I will nap a lot, by myself and dream of my sweetie. We found out some sad news over the weekend. 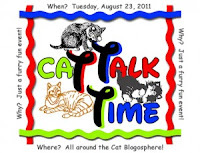 Our of our original buddies on the Cat Blogosphere, Edsel, lost his human mum to brain cancer. 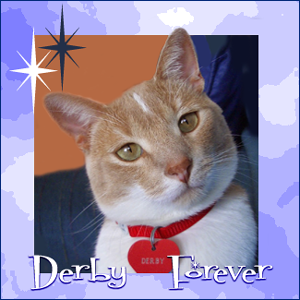 Me, Derby, remembers way back when we first purred for his mum as she started to go through her first treatments. 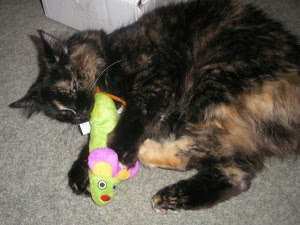 You may see other long blogging kitties doing a remembrance to Edsel's mum on their blogs over the weekend. Edsel is a good guy, a handsome tuxie, much loved by his mum and dad. He was fun to be around and was a wonderful tub hockey player. We have missed him being part of the blogosphere after his mum got sicker. So send lots of purrs to Edsel and his family. 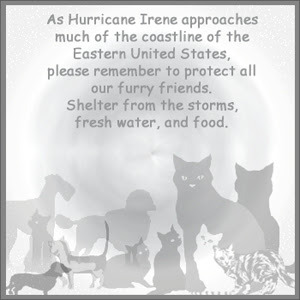 We think most of our furiends did ok through the nasty Irene storm. We had a few kitties teleport over for sunny and dry skies. Nice to see you, glad you are all safe. We mean this storm. You just leave all of our furiends safe, dry. All the other people and fur kids out there too. Just freaking go away from us. Our weather is supposed to stay all nice. So please feel free to teleport over. Windows should be open, weather dry, sunny sky during the day, starlight at night. Mum saw us both staring out the front window, so when she went out to water the flowers in front she saw what we were staring at. A dead, rotting chipmunk. Mum didn't take pictures, too icky she said. She took the hose and let the water push it off the cement into the flower bed. It can enrich the soil. Mum is getting ready to shut down the puter for a while. We are going to watch the Packers play preseason. Plus she needs to work on her crow-shay. We will have to get her to take a picture soon. Good day every one. Virginger here. I was thrilled to be the center of attention here on Tuesday for Cat Talk Day. Yes, we Squillions are a hardy bunch of 'ramic kitties, spread out all over the world. The garden is starting to slow down a bit, nothing new but still things to show. they come and raid the hummer feeder. Sweet is sweet. Then we get some of the fevvers stopping by to take a bath or get a drink. Yeck! Who would want to drink someones bath water. But the fevvers don't seem to mind. Little goldyfinch coming in to get a quick drink. The boys are inside with their guests. I felt a rumble the other day, probably it was them that caused the earth to quake. We has a huge sad. 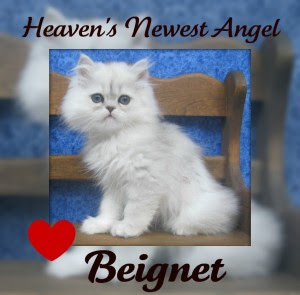 Little mancat in training Beignet didn't make it through his second surgery on Tuesday. Huge purrs to MomPaula and his little sisfur Truffles. So we are just going to hunker down and purr. Dora and Beau Beau are here hanging out. Mum doesn't have a clue, other than the food dish is getting empty quicker. Now it means two things. Lots of something or our very own 'ramic sisfur Virginger the the squllions and squillions of her littermates. A few of Virginger's litter mates that we fostered From Left to right. Mandy, Mango, Inky, Blackie, Ashes and Storm Cloud. Plus a link to way back when were we posted about our favorite words. On a sadder note Misses Peaches ran off to the Bridge, joining her beloved Mickey. Farewell sweet lady. Plus we are welcoming house guests. Dora, is coming to visit Ducky, versus hanging out in kittie jail. This is the second time in the past month her beans have deserted her to run off on holiday. Beau Beau is just coming over to get away from his beans. Seems he didn't come home when expected and they were all worried. He thinks he is in BIG trouble. 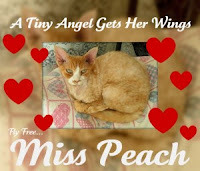 Plus lots of purrs for Mom Paula and Beignet. Poor little guy had a furry bad reaction to a shot and they found a tumor. Sadly he won't now be coming to live with Mom Paula. Way too much going on, and not all of it good. Purrs to all. HiYa, Ducky here. Yeah, we don't like to get wet. My dearest sweetie was outside in the rain last week. Dora wanted her mum to turn off the rain, but mum's can't do that! So she got all wet. The water we want is in our water dishes. Yes that is dishes. Mum has various places we can drink from all around the house. Plus she got us a new one last week. Mum likes it because it is easy to fill and clean, no bottle to hold water, just the dish. Although she actually likes it best without the top bubbly slide and just runs it with the dish and the pump to keep the water moving. Derby has used it, mum hasn't seen me drink from it yet. Derby and I confering this weekend on what to do. We decided it was a good weekend to just chill and mum did the same. We had lots of open windows, cool breezes, grilled chickhen and some ice cream too. This is what we are doing today. Snoozing with the bears. Cloudy and rainy earlier, now a bit sunny. Mum is doing the laundry and reading. We are all just being a bit lazy today. Yep, we are. Hello and welcome, Virginger here. Last week I had the password wrong. ::blush:: welcome anyway. Come see what is going on. On the front side of the house it is all busy and dirty. They are working on burying big, black, tunnels under the ground. ... you can just see the top of his head and the little shovel thing would drop in rock into the hole. The guy who drives this around drives like a crazy guy, but he keeps his drinks all fastened to the top of his machine. Mum saw this hornet or wasp nest across the street. The beans have move out of the house, so no one to tell. We all plan to leave them alone. But enough of the noisy stuff in front of the house. Let's go to the back where we can relax. Pretty cone flowers with a flutterby on them. Black eyed susans, who show up so bright all the time. The flutterby again, taking a long sip on some other flowers. Mum likes to put in flowers that attract the flutterbys to come and visit. The hummer coming to take a drink. We have been getting to see them more often, and we saw three of them in quick order and they couldn't have been the same one three times. Two were there, and chased each other away, then a third one zipped in while the feeder was open. Guess some of these guys don't get along well. Enough for this week. Nice to have you stop by. 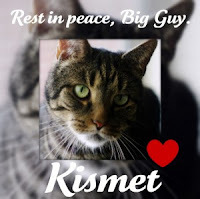 First of all I want to salute a dear blogging furiend, Kismet. He put the MAN into ManCat. He ran off to The Bridge on Caturday while sleeping with his bean. Farewell buddy, see you again some day. He was hanging out in Whiskercon when he left. Good place to leave, this is God's Country, you know. We are being blessed of burdened with extra mum time. She is taking some days off from day hunting to catch up on things. Like sleep, cleaning, reading, napping, playing with kitties and startin to crow-shay a baby blanket. Mum says thank cod that football is back, she gets most of her crow-shay done during games. Ducky hanging out on the end of the couch watching mum do her thing, or maybe she was just resting. He is all dreamy since Dora accepted him as her ManCat. Both of us inspecting the laundry dryer thing. No kittie was warmed up or hurt. I inspected the insides, Ducky just watched. Me showing mum by backside while she readed her book. The weather has changed, the hots and humids are gone. Windows are wide open so we get lots of fresh airs, birdies singing and such. Mum says it makes for nice sleeping. A word of thanks to Virginger for holding the blog for us. She does deserve some more time now and then.Yeah, I admit it, I am an old softy. I have a song in my heart and my paws are walking on air. 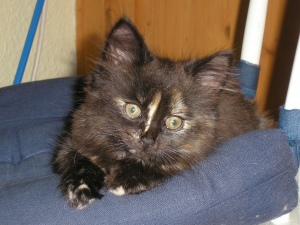 My little sweetie, Dora, who I fell in love with many, many months ago when she was just a little kitten. She is now a very lovely little ladycat. As I said, I have all sorts of songs running through my head, but here are the two that I like the bestest. Thank you Dora for agreeing to be my sweetie. Who could it be? Believe it or not it's just me. I am one happy ManCat! Hello again and welcome to Garden Thursday with your usual hostess Virginger. First thing to say is the hots are gone and our windows are open. We are all loving that. Above is me checking out the coneflowers, looking for flutterbys and bees. They both love this flower. Mum has what she calls a sundial in the garden, which is supposed to tell time. Except it is in the shade most of the time. Guess that isn't a good way to tell time then. One of mum's favorites, Star Gazer Lilly, she had a plant and it died, so she got another one. This was the first bloom and we had 7 blooms in all. Mum letting me get close for a really nice look. They boys may be back, but I am still in control of the blog, for now. Mum went off on Caturday evening for dinner with Miss Lynn. She also got introduced to the new member of the family. Back in July we told you about mum's furiend, Miss Lynn, whose woofie ran off to The Bridge. Well Miss Lynn has a new puppy! Introducing Miss Shelby who is an Irish Terrorist. Oh mum says that is an Irish Terrier! She is now 14 weeks old and will get to be about twice the size she is now. Miss Lynn and Miss Shelby looking at the toys mum got for her. Plus some chew things! Sitting by mum, being a little tired and needing a rest. Getting a hug from mum. Mum says once she sat down on the floor Miss Shelby was so happy and would climb in her lap. Time for another nap, but using mum's leg for a pillow. Welcome Miss Shelby. Hello and welcome to Squillion Cat Monday or World Cat Monday too. It's me, Virginger. 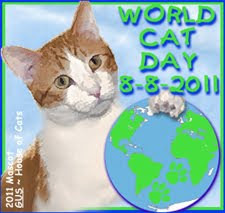 Yes, we Squillions count for World Cat Day! Still here, keeping up the blog, the boys, still AWOL in Bora Bora. I came inside for a while to keep mum company, looking at the outside from the inside. I don't do this very often. Getting really good ear scritches from mum. Taking a really nice long nap with mum too. Mum cooked outside, we have the before (uncooked) picture and the after picture too. Guess who just dropped back in. Derby has the lazers on, that means trouble. See ya. Sending Purrs - Virginger takes over!